The first pictures on the photo gallery were of Nattie at the Canberra balloon fiesta in March, however the photo gallery was still in a trial period at that time. After a little while it became the official image repository for this blog as it automatically resizes pictures and gives them URLs without me having to think about it, and whilst blogger.com now has image uploading, the photo gallery still mirrors most of the images used here and often has more. 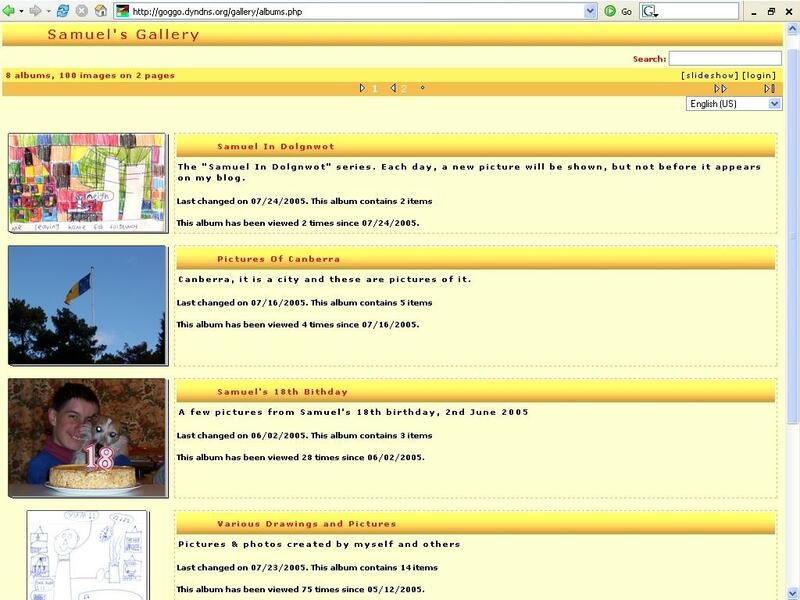 The photo gallery went into true production mode when Linux.Conf.Au 2005 came to town, becoming one of the most popular websites of the conference receiving 306 visits with 2357 page views. During this time it received 16748 hits, some of which were from images on this blog, which was one of the most popular blogs during Linux.Conf.Au 2005 and was used as a news source by The Register for Andrew Tridgell’s bitkeeper demonstration. Since this time the photo gallery has received numerous pictures covering things that Nattie has done, pictures I have drawn and numerous other things.